Borealis Press is delighted to announce the release of a novel about lifelong friendship and the challenges confronted along the way. It should have special appeal for readers familiar with Toronto and Ontario cottage country, the principal venues where the novel unfolds. $19.95 Cdn. 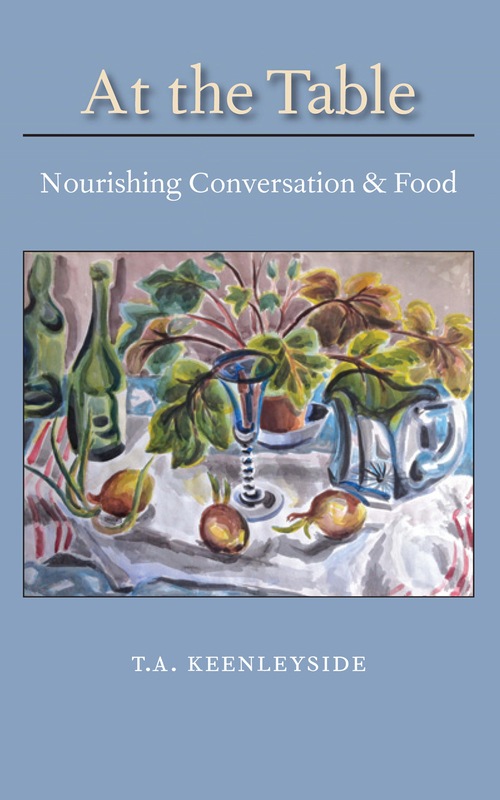 Available at select bookstores and online at http://www.borealispress.com. 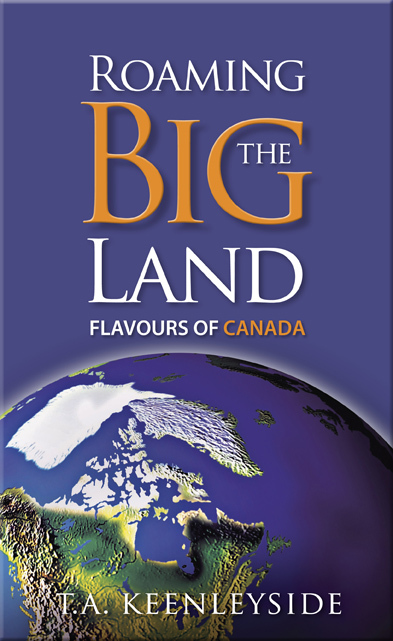 Personally autographed copies may be purchased directly from the author by going to: terdotcomm@sympatico.ca. The Novel, “All The Way” Coming Soon! 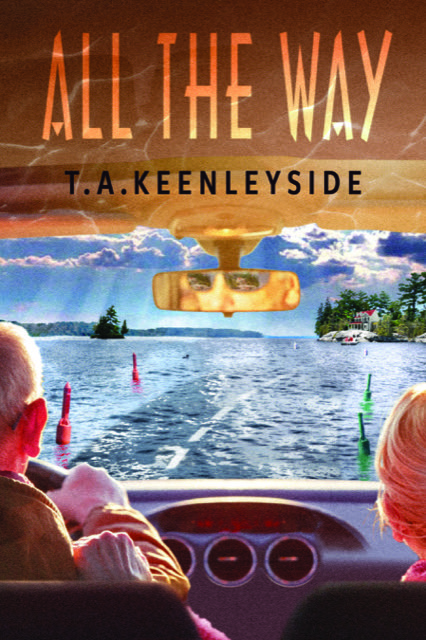 All The Way, a new novel by T.A. Keenleyside, will be released in March by Borealis Press of Ottawa. Six teenagers meet at a summer hotel in 1958. It is at a time in life when they are full of energy and high spirits as they optimistically plan their futures. Libidos are also running high and that leads to a clash for sexual attention between two of the characters that over time affects them all. Together with two other teenagers, who spend the summer of 1958 on an adventured-filled student tour of Europe, the eight characters forge lifelong friendships that are traced over the sixty-year span of the novel. 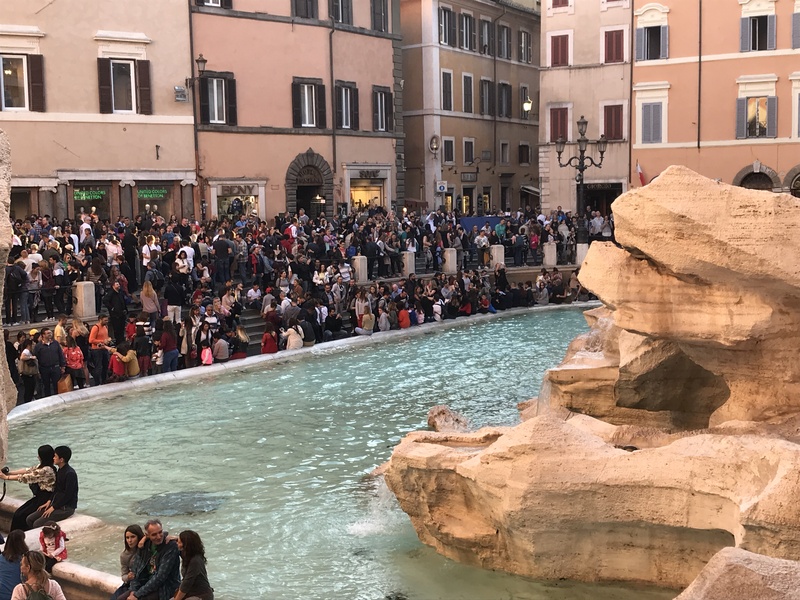 No longer is it possible to have an unobstructed view of the fountain, and to push your way through the throng close enough to toss a coin into the water is likely to take several minutes. 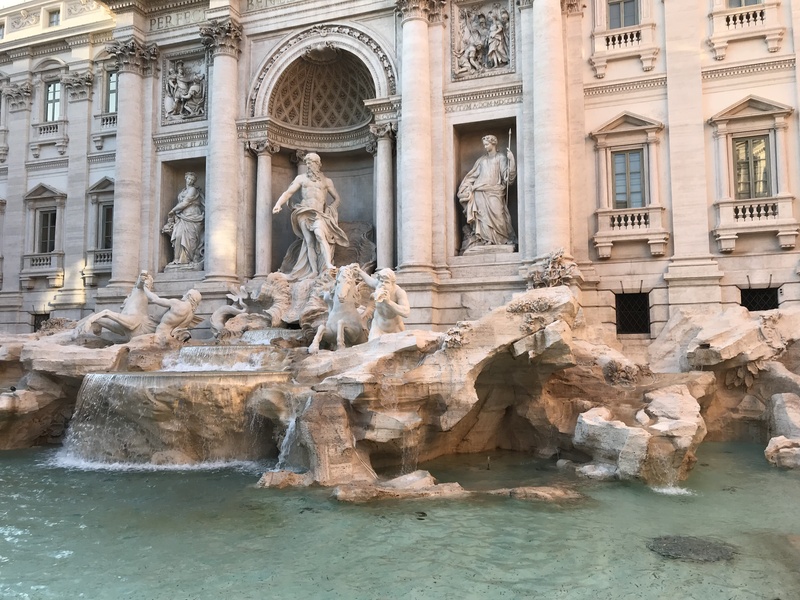 How I long to see that fountain again the way my family did in 1971 when we sat on the bottom step in rosy twilight with a handful of other people while our son lazily kicked a soccer ball back and forth to two amused Italians. Then the statue stood in dignified majesty, enjoyed in an atmosphere of unhurried appreciation of the aesthetic. It was simply another beautiful work of art in a city brimming with such elegance, a spot to be quietly enjoyed by passers-by, some tourists, yes, but mainly local Italians. It wasn’t a square where you jostled for position to take a selfie or shoot a film on your cellphone. 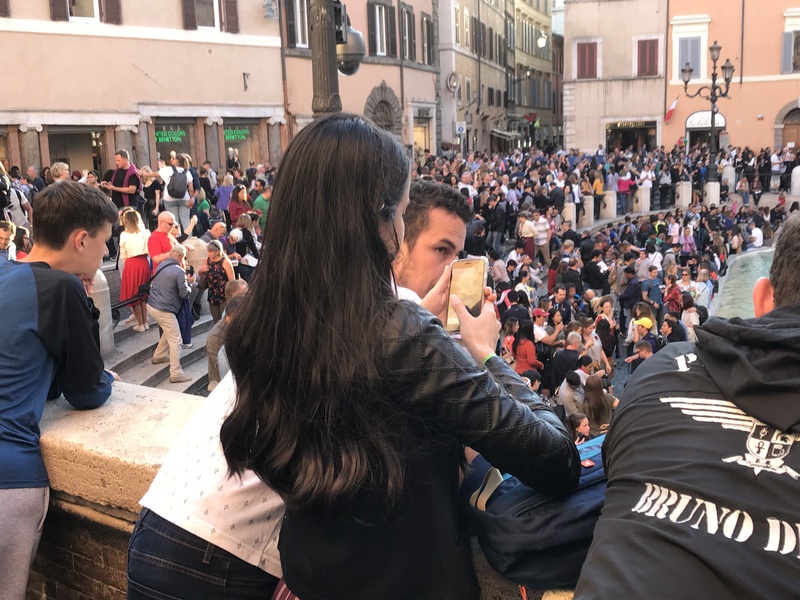 It wasn’t a spot where the view was regularly blocked by ipads and other devices held high, and quiet reflection was rendered impossible by the din of the crowd–a crowd ever in motion, marching from one famous location to another, checking off the sites on their global to-do lists. Where to go next? 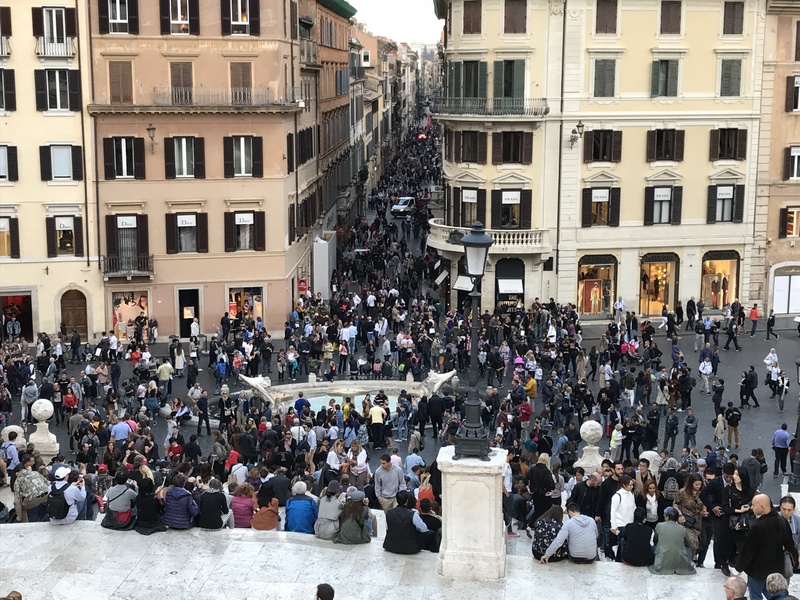 The Spanish Steps, of course! How I longed to see Rome again as I had first enjoyed it in 1958 and again as a family in 1971. Now, sadly, as Paul Fussell wrote in his insightful book “Abroad,” we are all tourists and even the remotest reaches of the earth have been sullied by a surfeit of our numbers, recording yet again what so many others have done before. 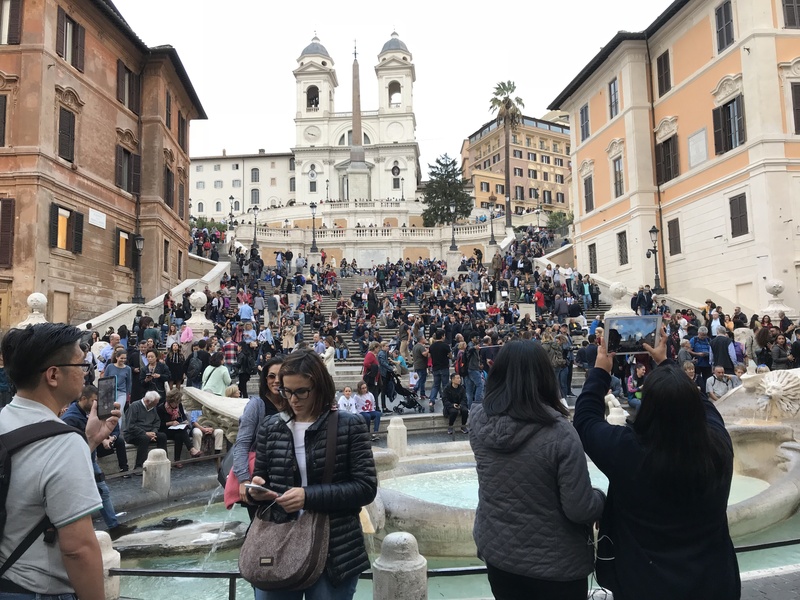 These photos help to confirm that there really is no longer an off-season at least in the great cities of the world, and especially at their most famous sites. Yet, it is still possible to sojourn to most places, especially outside the high season, more as a traveler than as a tourist. But that requires largely eschewing the starred places in guidebooks in favour of other locations that remain authentic and not overrun with people. 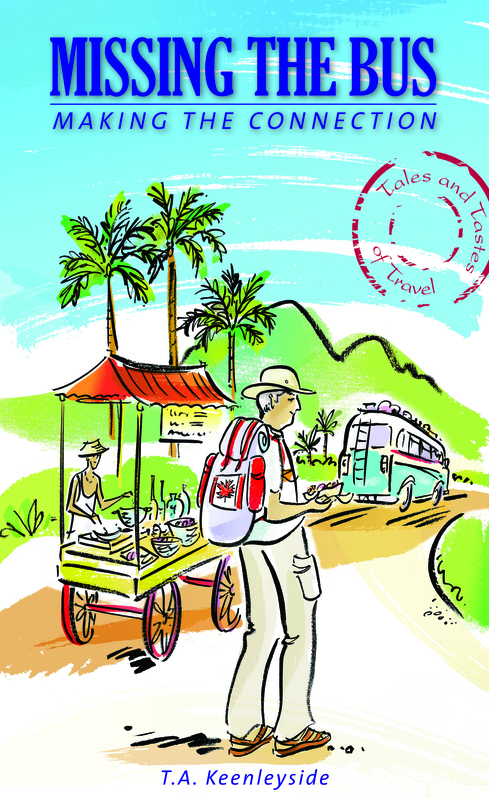 For a collection of stories that explore over twenty countries from this perspective, why not order a copy of “Missing The Bus” by going to: http://www.penumbrapress.com or by contacting the author directly at: terdotcomm@sympatico.ca. Oh, and here is a tip on a great place to visit in Rome that in our experience is not overcrowded: the Palazzo Doria Pamphilj with its stunning art collection, including Velazquez’s famous portrait of Pope Innocent X. The audio guide is the best anywhere, for it is the current England-educated occupant of the palace, Prince Jonathan, who takes you on the tour and his commentary is full of delightful personal recollections about the palace and references to the historic intrigue that characterized all the great families and homes of Italy. He does, however, omit any reference to the thoroughly modern quarrel over the future of the palace that has gripped the Pamphilj family in recent years. Ask one of the guides there in person about it. Borealis Press of Ottawa will soon be releasing a dramatic, new novel by T.A. Keenleyside, entitled All The Way. The book follows the ups and downs in the lives of eight friends over a sixty-year period. 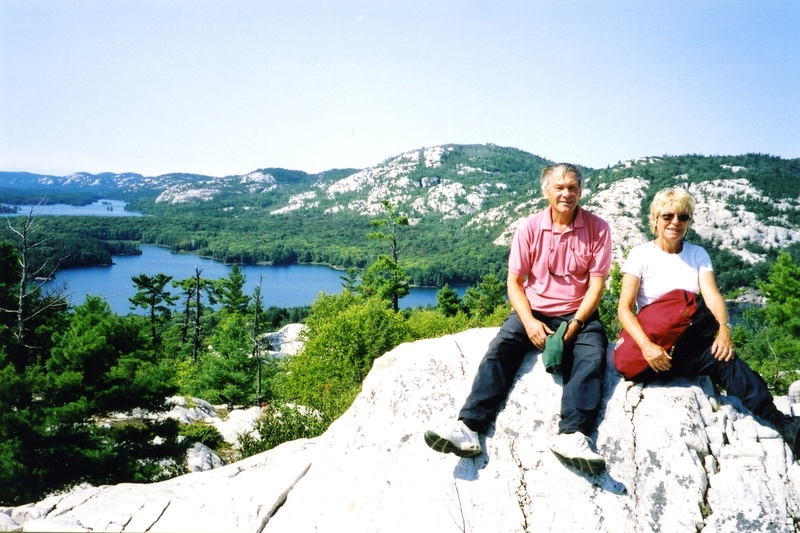 It is set mainly in Toronto and in cottage country on Georgian Bay, Muskoka and the coast of Maine. More to follow on publication. Wow! Just think of it: little Croatia, a country of barely four million people and an independent state for less than 37 years knocking off some of the great powers of football and, indeed, of global affairs, countries like Argentina, Russia, and even mighty England. It is quite an achievement for a small, long-suffering country, bloodied by a vicious war for independence and subjected to protracted hardship and deprivation. Now it is winning on the relatively peaceful pitch of World Cup Football, beating even the founder of the game itself. Some might even describe Croatia’s current success as nothing less than a miracle. But then Croatia, like so many European countries, is accustomed to miracles. 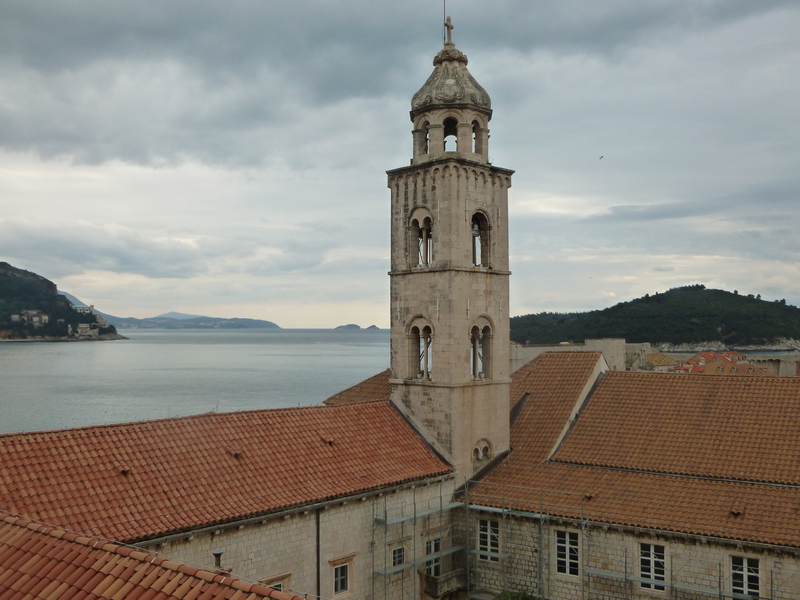 Dubrovnik, its most famous and stunningly beautiful city, was, after all, saved from an attack by Venetian galleys in A.D. 971 only by a miracle wrought by St. Blaise, patron saint of the city. 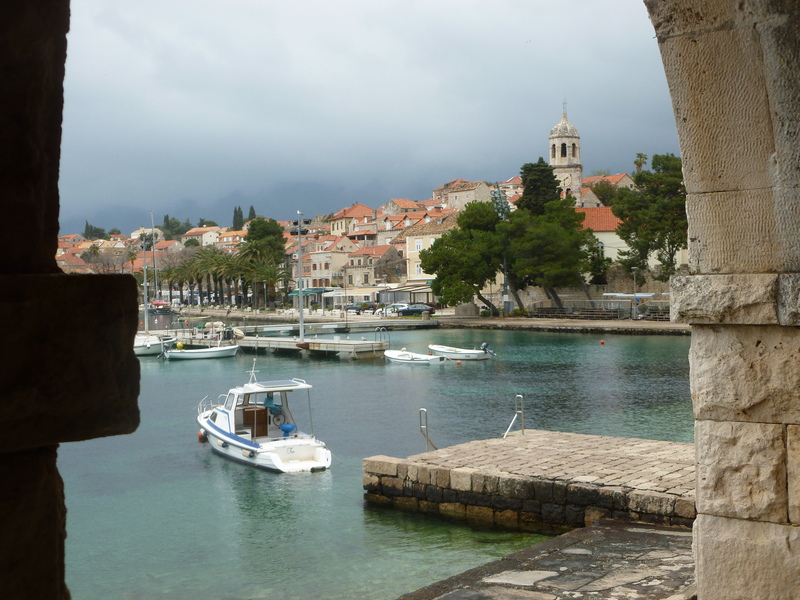 The Venetian ships had dropped anchor not far from the port city ostensibly to take on water, but with the real intent of scoping out Dubrovnik’s defences. Their plan of attack was revealed in a dream to a canon of the city’s St. Stephen’s Cathedral; a vision appeared before him of the saint as an old man with a long beard, wearing a bishop’s mitre and carrying a staff. 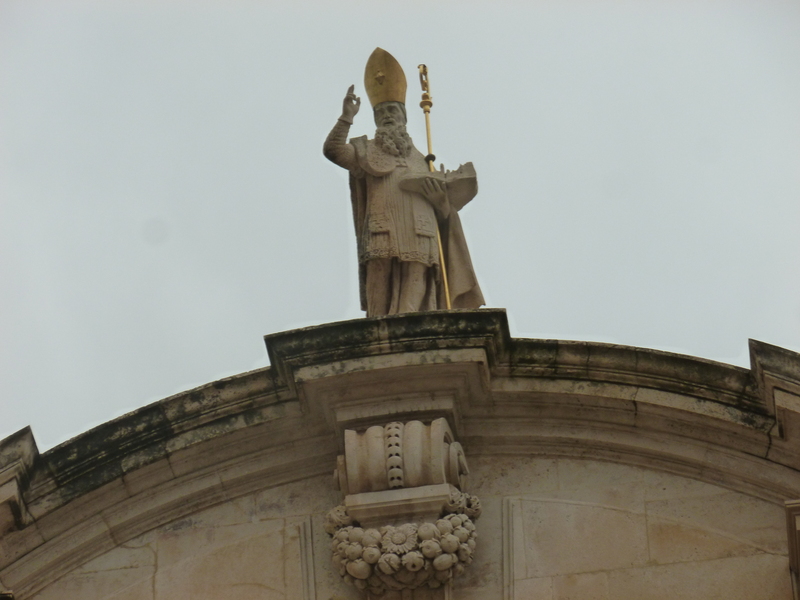 In just such garb, St. Blaise appears atop the church bearing his name in the very centre of Dubrovnik, for it was his warning to the canon that allegedly saved the city from the Venetians. In front of the church is a stone column and carved into it is the figure of a medieval knight, named Orlando. 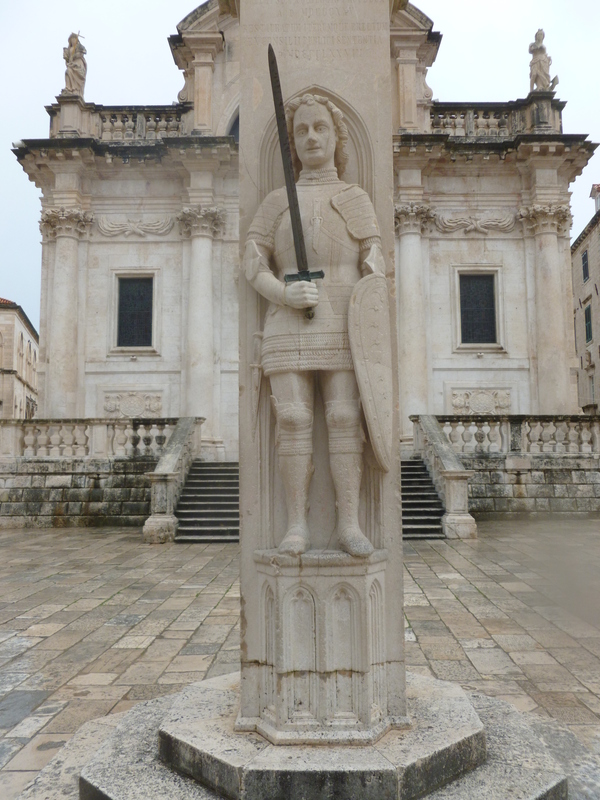 According to legend Orlando helped liberate Dubrovnik from a siege by Arab pirates in the eighth century, and the statue is accordingly a symbol of the freedom of the city; the flag of the republic always flies from the column on important festival days, such as February 3, the feast day of Blaise. That is the day when relics of the saint are paraded through the streets of Dubrovnik: his head, his hands, and fragments of bone from his throat. Why the bits of bone one might ask? Well, Blaise started out as a doctor in Armenia in the fourth century, and pretty quickly he was performing medical miracles. Even wild animals purportedly came on their own to be healed by Blaise and some are said to have actually assisted him in his work. Eventually, he was made bishop of his home city of Sebaste in Armenia and his count of miracles rapidy climbed. But that lasted only until A.D. 316 when the Roman emperor ordered the killing of Christians in Armenia and Blaise was arrested. While on his way to jail, he was stopped by a desperate mother who beseechingly laid her only son at Blaise’s feet, choking to death on a fish bone. Instantly, the child was cured, although that did not save Blaise from being beheaded when he refused to renounce his faith. 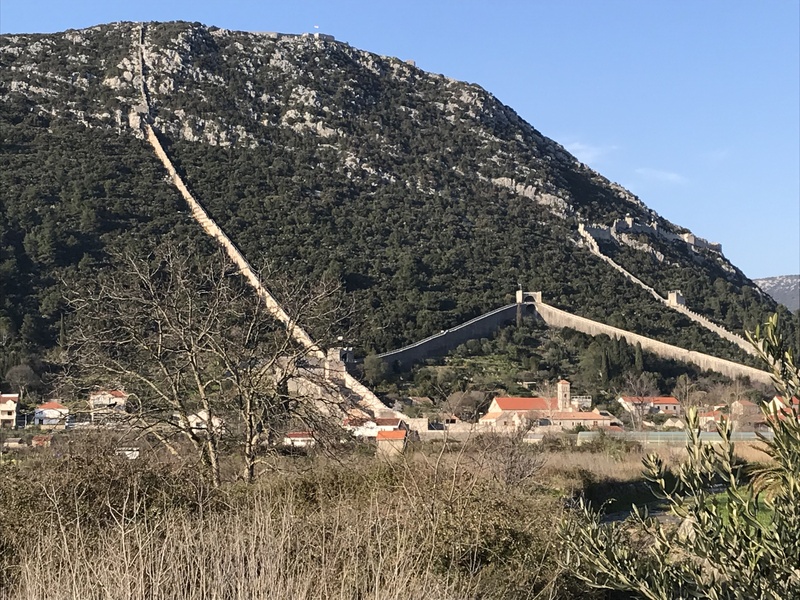 So Saint Blaise is important to Dubrovnik not only in the defence of the city from enemies, but in protecting its citizens from choking, a reasuring fact in a seafaring city where, today, grilled sea bass and sea bream do not always come filleted. 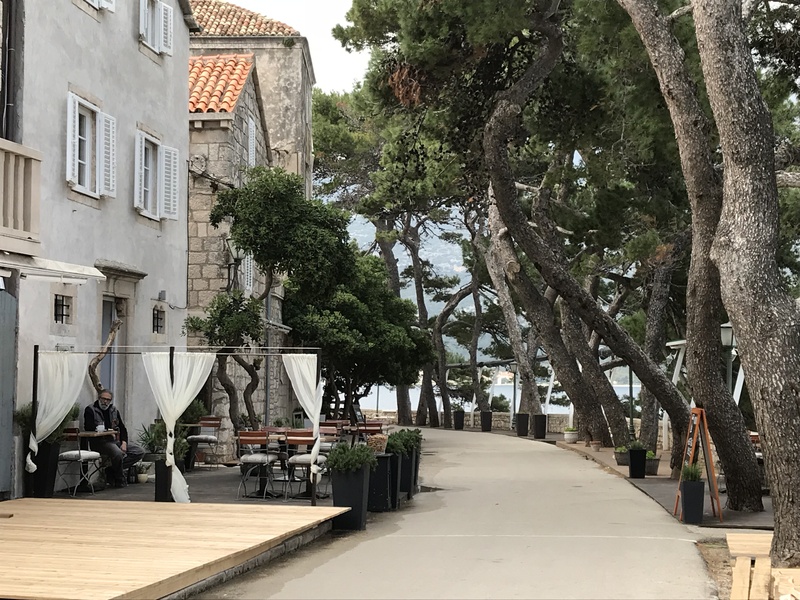 Seductive Dubrovnik is hard to leave, but there are other intriguing places to visit along Croatia’s rugged coast. 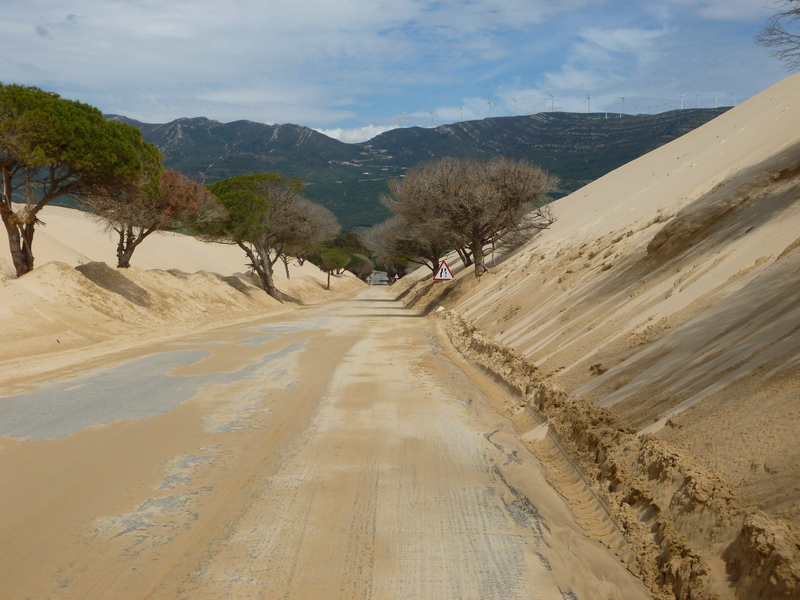 There is, for instance, Ston, famous for its oyster beds, salt pans, and defensive walls. Our guide, a battle-hardened veteran of the war of independence, informs us that it is the second longest such wall in the world after the Great Wall of China. It isn’t, but it is by most accounts at least the second longest in Europe. 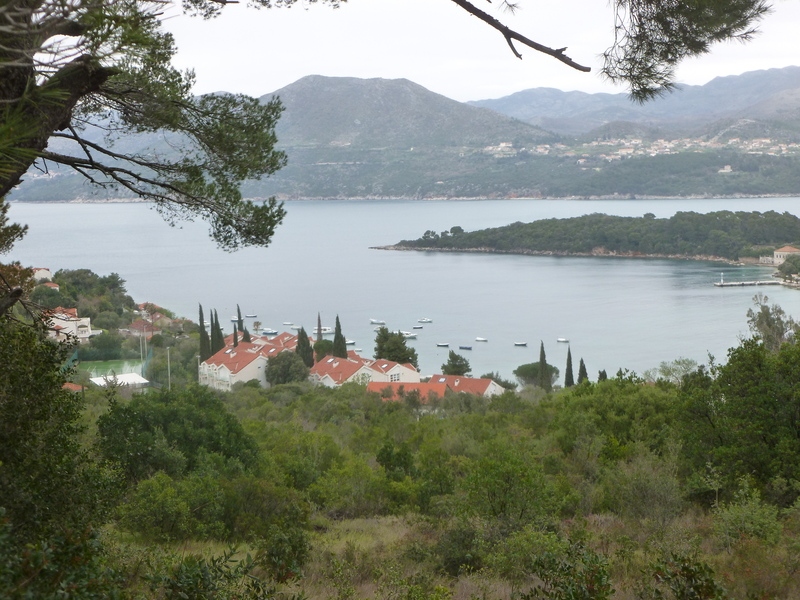 There is the island of Korcula, which many Croatians contend is the birthplace of Marco Polo, although there is no concrete evidence to support this claim and the probability is that he was born in Venice. But who cares about these little exaggerations? 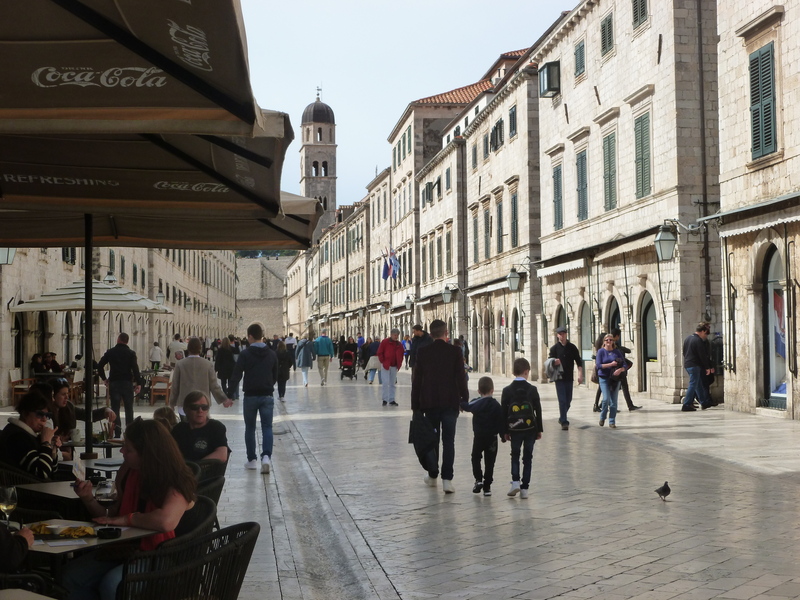 Small countries need to boast a little, and, besides, there will be less of that now with Croatia’s World Cup success. The little Elafiti Islands of Lopud, Kolocep and Sipan, still recovering from the ravages of the war of independence, are each worth a day outing by ferry from Dubrovnik. 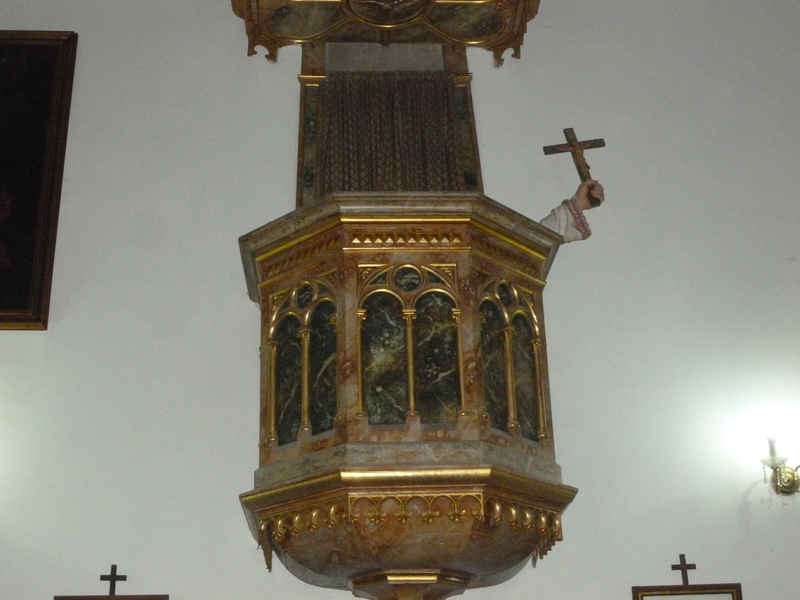 And curious pulpit in the Church of Our Lady of the Snow. 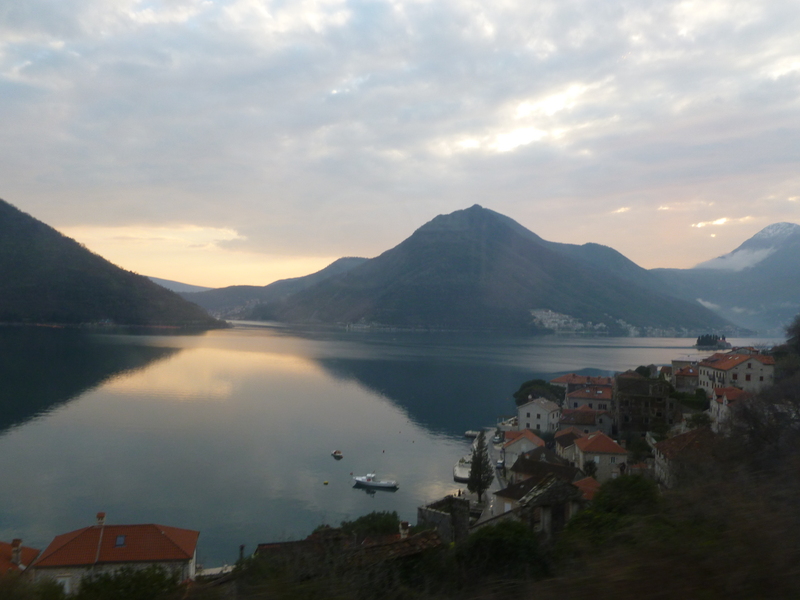 A little farther afield to the south once can venture into Montenegro, especially for a visit to the ancient city of Kotor, situated deep in an inlet from the sea, surrounded by bald, limestone peaks. 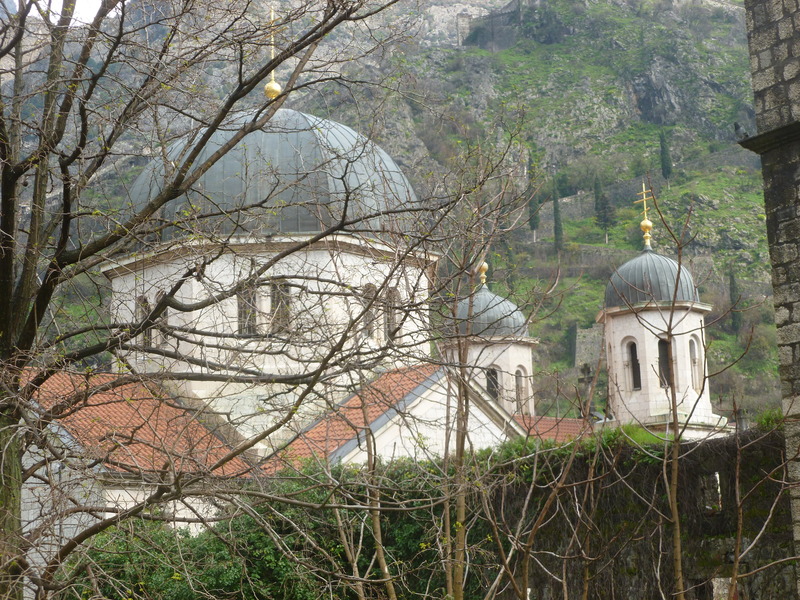 And to the northeast one can travel into Bosnia Herzegovina for a visit to Mostar. Here the scars of warfare remain abundant, even though most of the country’s mosques have now been rebuilt. 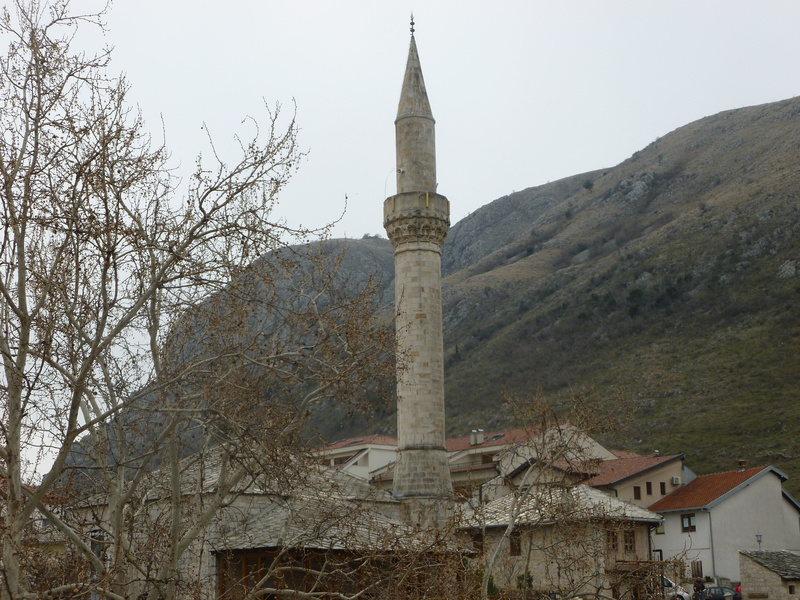 It is one of the ironies of the wars in the Balkans that at some locations you can catch sight at the same time of three different places of worship–mosques, Eastern Othodox and Roman Catholic Churches as the communities once again warily attempt to live side-by-side in peace and friendship. 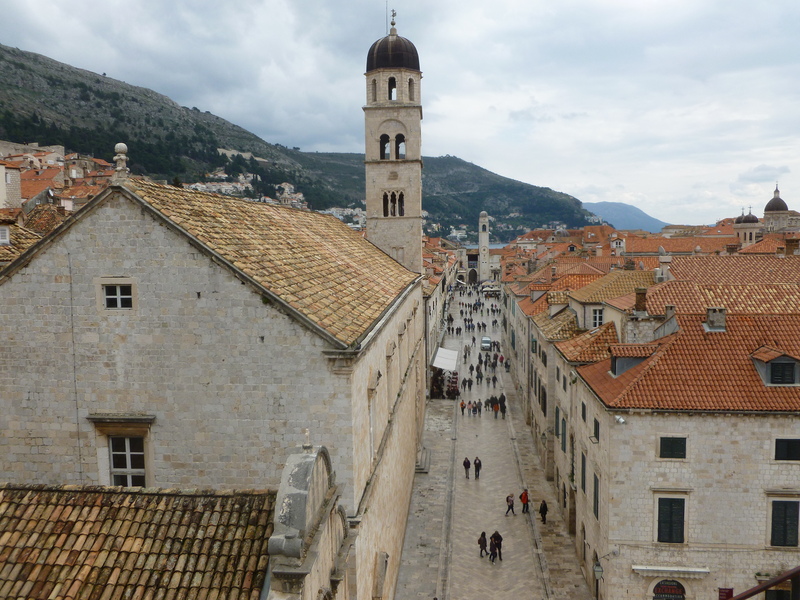 It is, however, back to the allure of Dubrovnik that one is constantly drawn, for it is the crowning attraction of the entire region, and a two-hour walk around its walls the jewel in any visit. We are in a sense lucky because it is mostly cold and wet during our stay in Dubrovnik, so traffic along the paths of the wall is light. Best not to visit the city in the height of the tourist season when it is so busy that the wall of this UNESCO World Heritage site often has to be closed to additional visitors. But with the weather so bad, we eventually run out of outdoor things to do in the city. It is at that point that I propose to the family a visit to the Franciscan Monastery which everyone has now seen from the wall. Our grandsons in particular receive this suggestion sceptically. Looking at holy relics, even ones that I assure them are likely to be goolish, does not really catch their fancy. We are standing hesitantly at the entrance to the monastery and about to turn away when the custodian makes us an offer I can’t refuse: six admissions for the price of three. Good old St. Francis, I beam. It’s like the miracle of the umbrella that suddenly appeared on the ground before us when we were about to walk in the rain to the good saint’s place of meditation outside Assisi (see the post entitled “Looking for Miracles”). 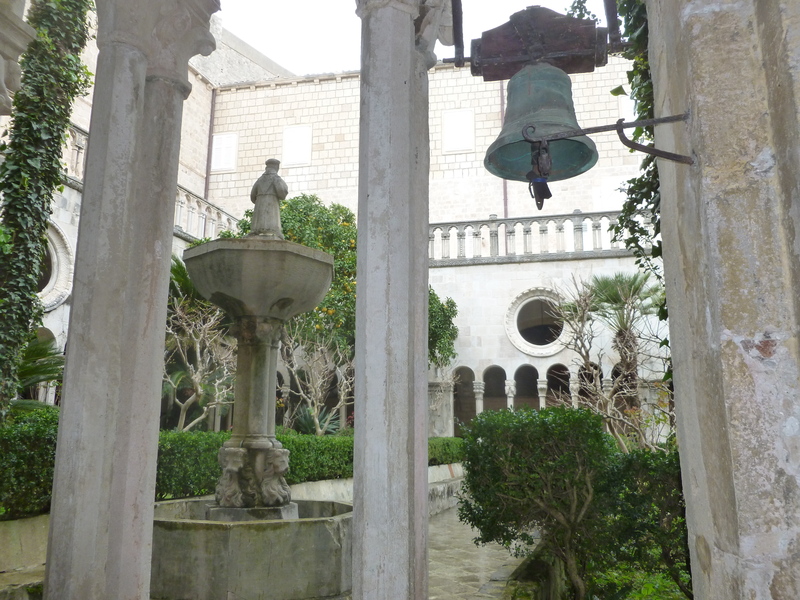 Dubrovnik is definitely worth a visit, but don’t expect a miraculous deal, not from the Dominicans at least! For more travel tales and recipes from around the world, try one of the following books available from http://www.penumbrapress.com or from the author by emailing: terdotcomm@sympatico.ca. 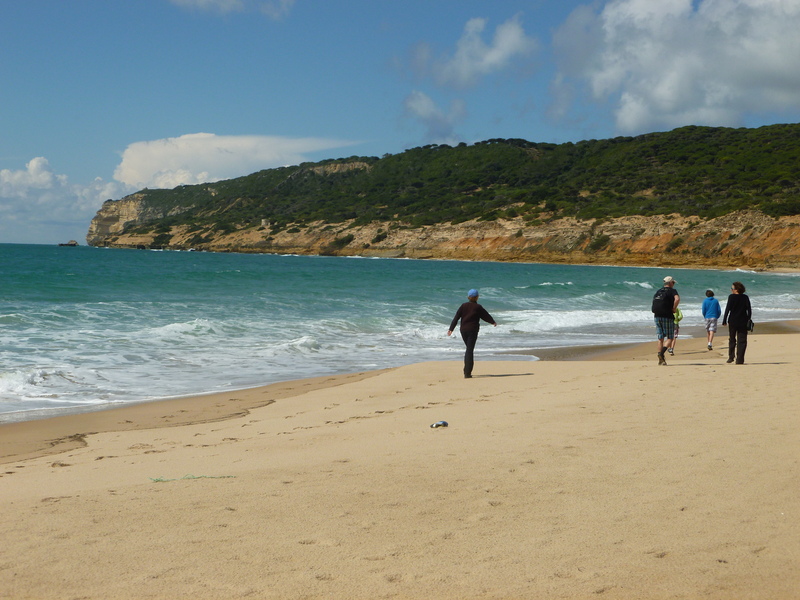 It is safe to say that before a recent trip to southwest Spain, our grandsons were more familiar with airborne battles on broomsticks as in the game of Quidditch than they were with historic conflicts at sea involving the British navy. For them, Harry Potter was already a beloved hero, while Horatio Nelson was a name they had never heard. Travel is, however, a great teacher and the boys are inveterate, unflagging trippers, always open to new experiences and to broadening their knowledge of the real world as well as the imagined. Spring is a perfect time to visit southwest Spain. The coast and charming villages of the interior are uncrowded; you can choose almost any restaurant for lunch or dinner without worrying about reservations. Equally important, it is a time of year when you can easily find tables on patios while sun, rather than shade, is what you are yearning for. 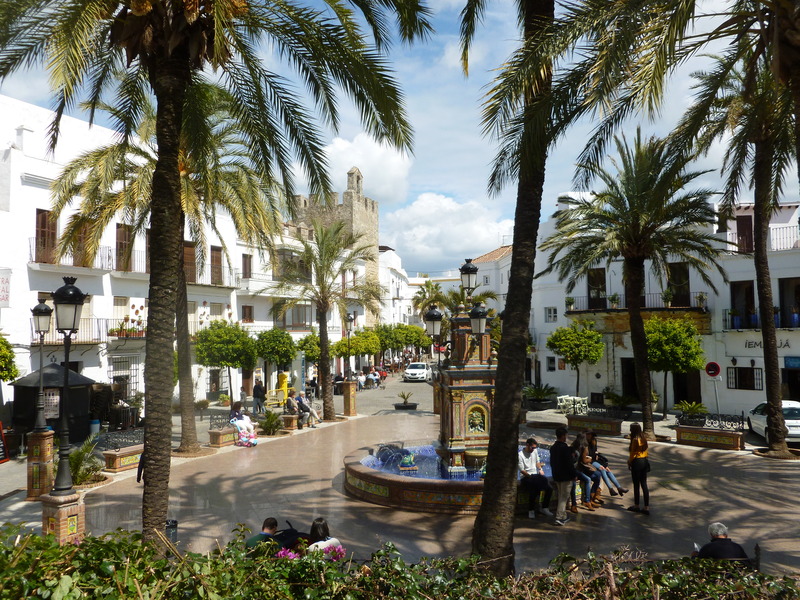 This corner of Spain also has the advantage of being largely overlooked by tourists from northern Europe who prefer the warmer Mediterranean coast to the beaches of the open Atlantic, so the prospects are much better of being surrounded by Spaniards than foreigners on vacation and thus of enjoying an authentically Spanish experience. 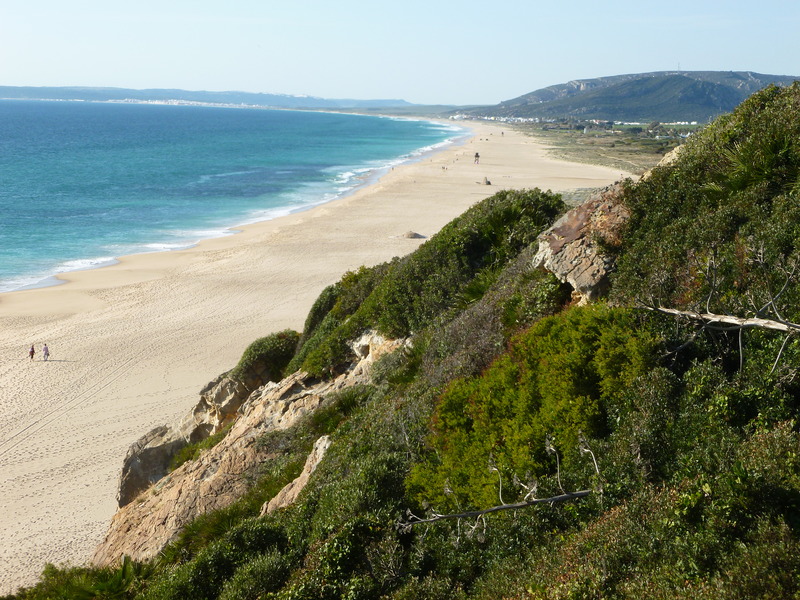 On a trip to southern Spain, we made the small, fishing community of Zahara de los Atunes–famous for its Atlantic bluefin tuna–our base for exploring the surrounding region. It proved to be a beautiful location for exposing our grandsons not only to Spanish culture, but to British history and to the exploits of Lord Horatio Nelson. To the east, an hour and a half away by car, there was Gibraltar for them to visit, the site of Nelson’s Anchorage where, after the Battle of Trafalgar, the admiral’s body was brought ashore from HMS Victory, allegedly preserved in a barrel of rum. Here, in this community seemingly as British as any south coast English seaside town, our grandsons also learned of Gibraltar’s status as an outpost of the empire from 1713 onward, and of the on-going friction between Spain and Britain over its future. 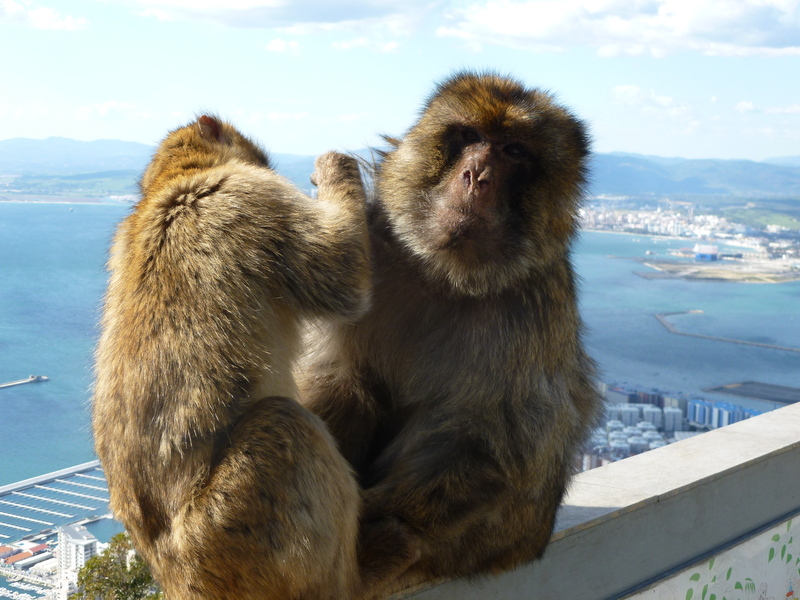 Here they climbed the Rock and met face to face the tailless Barbary macaques who, according to legend, will be there until the British leave Gibraltar. 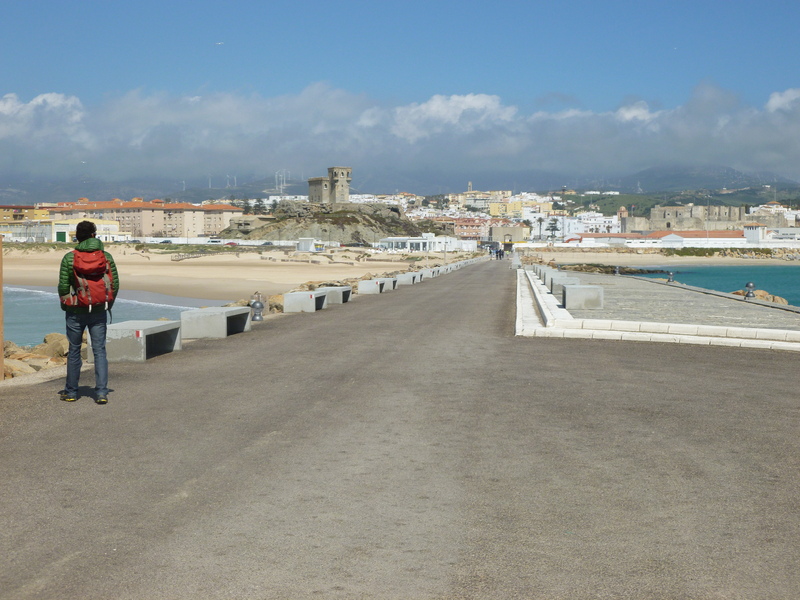 Further east, they walked the beach at Tarifa and gazed at the spot where the warm Mediterranean (on the left) meets the colder waters of the Atlantic Ocean. 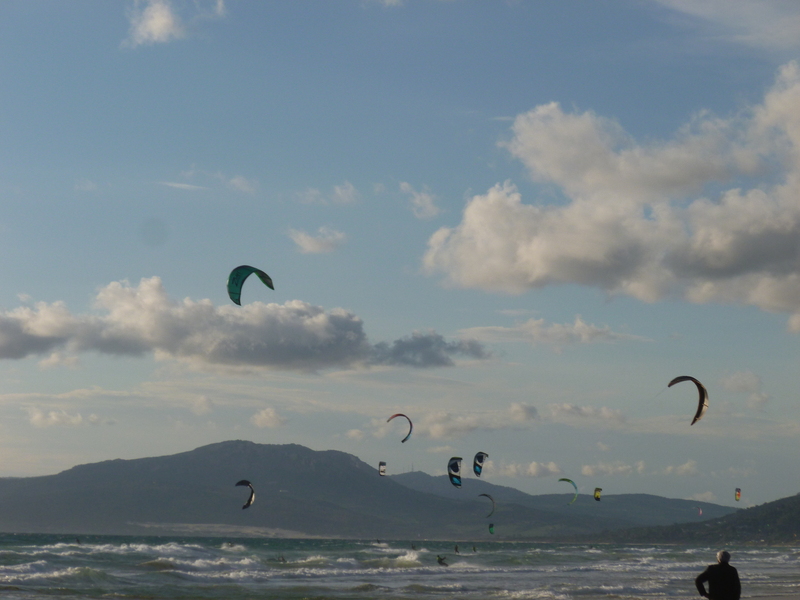 Here, too, they watched with envy the hordes of kitesurfers and windsurfers flying along the shore of one of the world’s most famous beaches for these activities. 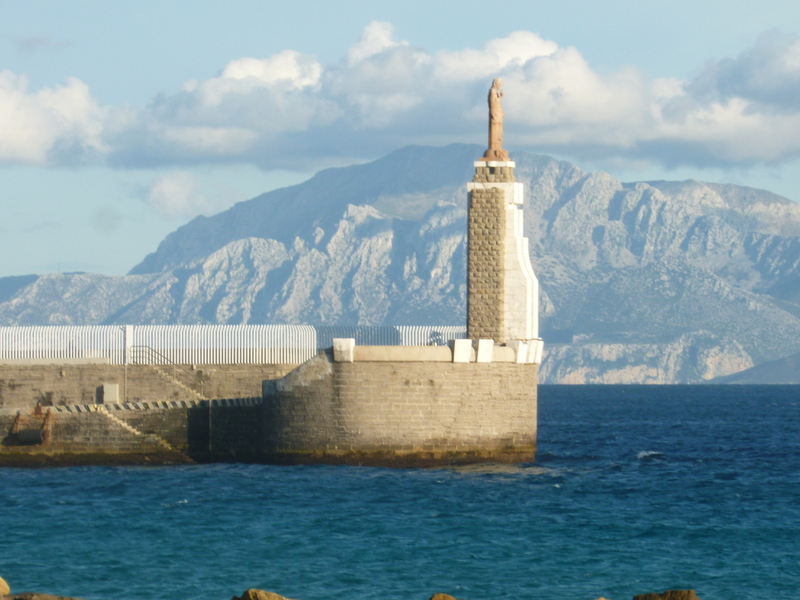 And from Tarifa, they were able to take a ferry across the Mediterranean for a brief visit to Africa and the port city of Tangier, once a fashionable destination for the famous and the wealthy before it was displaced by Gibraltar as a tax-free haven and shopping destination. One day in North Africa was enough to whet their appetites for future exploration of the continent and its varied cultures. 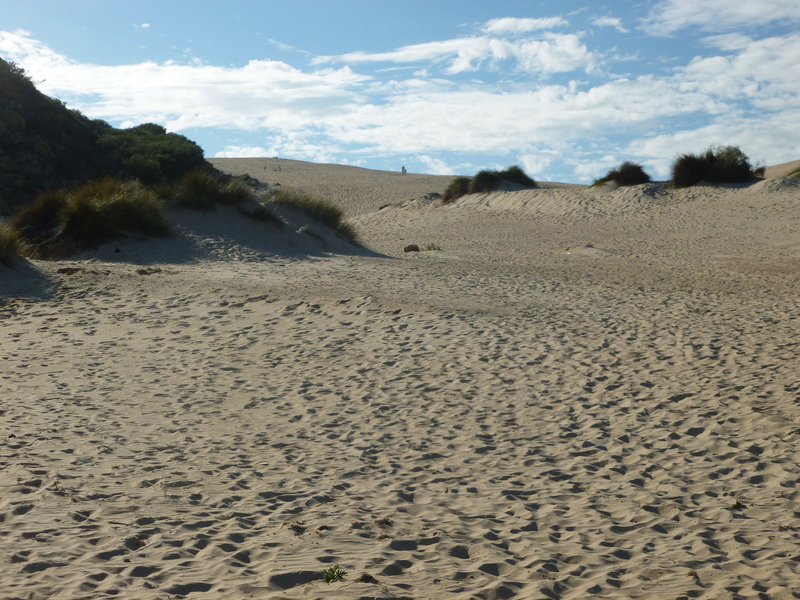 Moving farther west, the boys were astounded by the height and breadth of the sand dunes at Punta Palma. And at Bolonia as well. 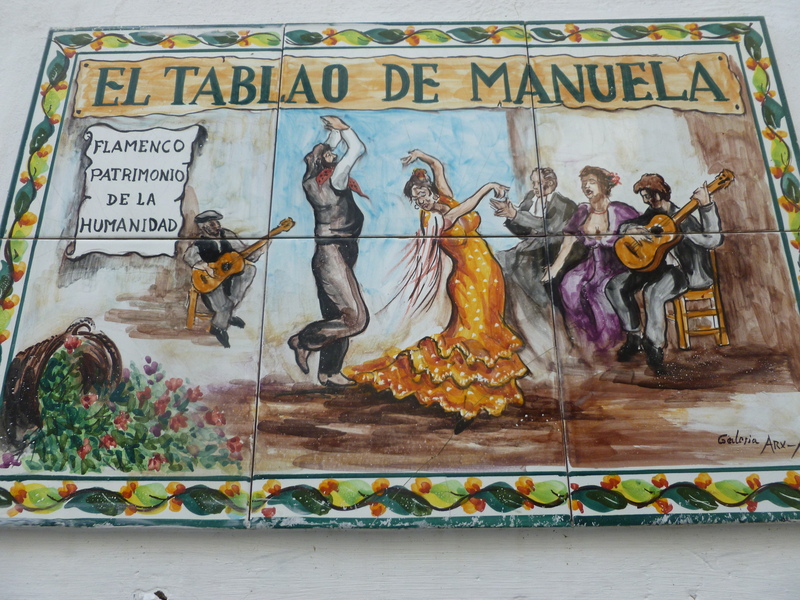 These coastal visits were followed by outings to the pueblo blanco–the white towns of the rugged, hilly interior: Arcos de la Frontera, a strategic clifftop village steeped in turbulent history and full of winding streets and colourful murals; Jerez (meaning sherry) de la Frontera, home to about 20 sherry bodegas and a key stop on the Andalucia region’s famous “sherry triangle;” and Vejer de la Frontera, everyone’s favourite with its quaint, picturesque squares and wide choice of restaurant tables, situated in warming, dappled sunlight. By now, the boys had asked the inevitable question as to why the names of so many towns included the word “frontera” and had come to understand how they were seeing what historically had been viewed as lonely, little-visited outposts of mighty Spain. But, most interesting of all for our grandsons from an historic point of view was to return to the coast a little west of Zahara de los Atunes and hike from the beach at Barbate on the east side of Cape Trafalgar to the village of Los Canos de Meca on the west to witness the site of Britain’s famous sea battle against the combined fleets of France and Spain. It was on October 21, 1805 that twenty-seven ships of the British Royal Navy decisively defeated a combined force of thirty-three French and Spanish ships of the line. Although heavily outnumbered and outgunned by the enemy, the British did not lose a single ship while France and Spain combined lost twenty-two. It was a victory that confirmed Britain’s naval supremacy for decades to come. These are facts well known by British school children, but I wonder how many of them are aware of an interesting detail of the battle to which our grandchildren are now privy. It pertains to to the famous signal hoisted on Nelson’s ship Victory just before the battle commenced: “England expects that every man will do his duty.” Initially, Nelson had requested the wording “England confides” and ordered that the flags be raised quickly as he had another tactical message to follow. But his signaler requested permission to substitute “expects” for “confides”, since the word was in the ship’s inventory of flags and would not have to be spelled out, thus saving time. Lord Nelson concurred, ensuring that history has been left with a much more memorable quotation than would otherwise have been the case! 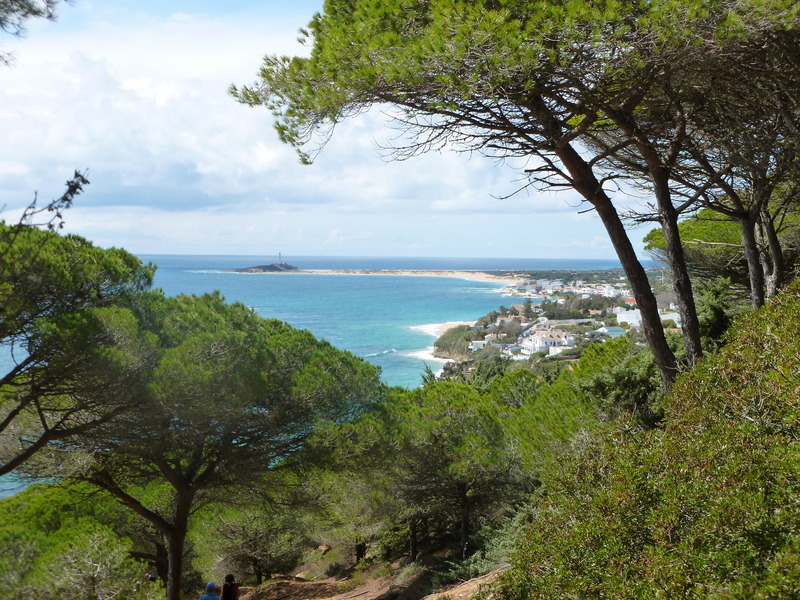 It is a lovely hike through a pine forest to the village of Los Canos de Meca on the far side of Cape Trafalgar. Midway along the path, you pass the 16th century Torre del Tajo with its stunning views across the Atlantic, but neither there nor anywhere along the route is there any mention of the famous naval battle that occurred in these waters. Looking down on Los Canos de Meca, you can see in the distance a lighthouse, on a spit of land. 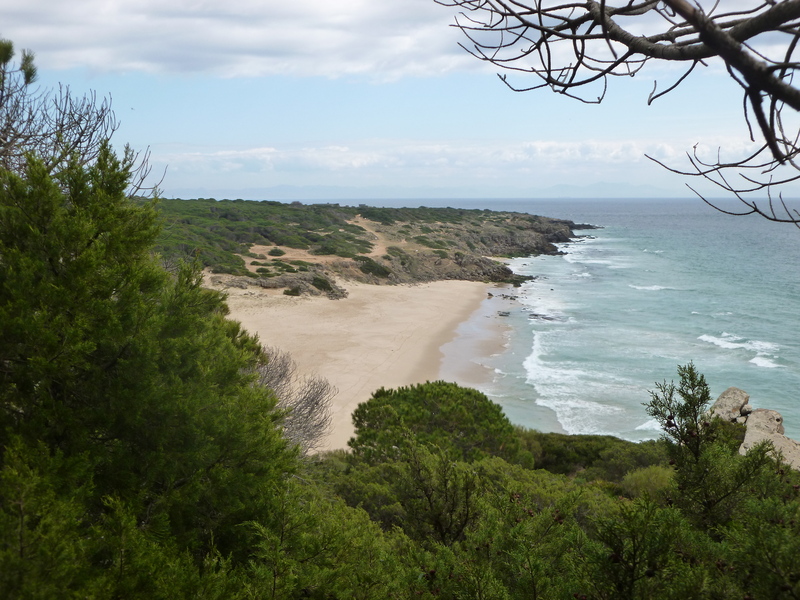 This is Cabo de Trafalgar, off which the battle actually occurred, and the lighthouse was the last glimpse of land that Nelson had before he succumbed to the bullet wound in his spine, inflicted by a French soldier firing on Victory from the ship, Redoutable. After their trip to Spain, the grandsons had only a few hours between planes in London on their way home to British Columbia. But it was time enough to visit two sights they were eager to see: King’s Cross St. Pancras Station where Harry Potter and his chums dashed through the brick wall between Platforms 9 and 10 to arrive at Platform 9 3/4 for the Hogwarts Express to school, and Trafalgar Square with its monument to Lord Horatio Nelson, victor of the Battle of Trafalgar. 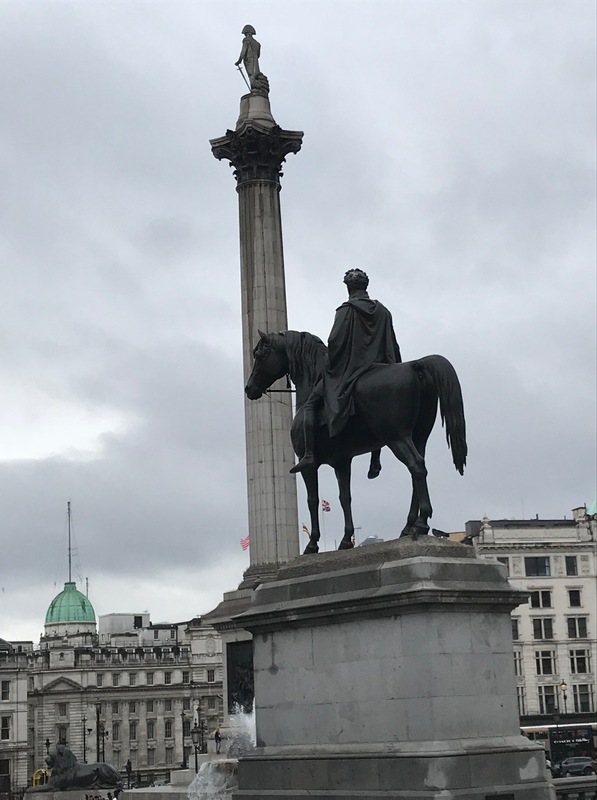 Our grandsons have never revealed which impressed them more: looking quizzically at a brick wall with a luggage cart embedded in it at King’s Cross St. Pancras, or gazing at the grandeur of the Nelson Monument, towering over the historic square in which it stands in the centre of London. Now that they have visited Spain and looked down from Cape Trafalgar upon the sight of that famous battle, I have little doubt what their answer would be. Rule Britannia! Here’s to the rewards of travel in the real world! For more travel stories, try one or more entertaining books by T.A, Keenleyside, available from: http://www.penumbrapress.com, or by contacting the author for a personally autographed copy: terdotcomm@sympatico.ca. Among the most famous writers of children’s books is the British author, Arthur Ransome. Unlike most contemporary writers of such books, he created adventure stories based on credible real-life incidents even though his youthful characters imagined events occurring that went well beyond what was believable. Of his twelve children’s books, his first, Swallows and Amazons, is undoubtedly the most famous. First published in 1930, it remains popular to this day having been reprinted numerous times and translated into several other languages. The book was also made into a highly popular children’s movie. 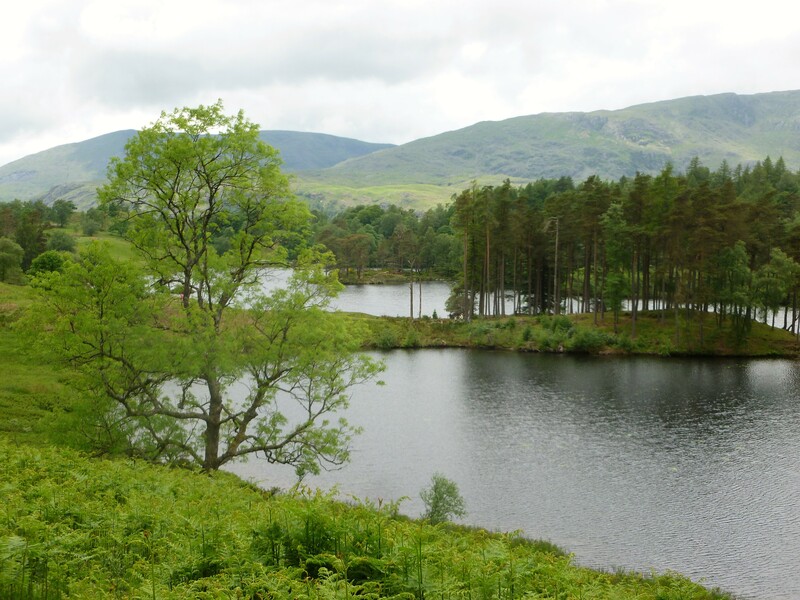 Ransome’s early children’s books are set in the English Lake District, especially in the area around Windermere and Coniston Water, although he modified the geographic features of these lakes to create his own fictional body of water. 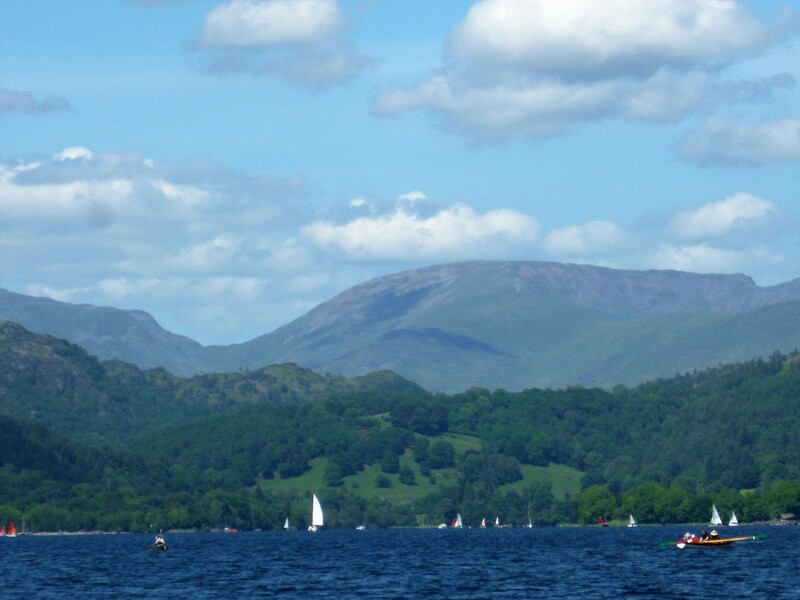 On it, however, he situated an island–Wild Cat Island–as the setting for the adventures of the characters in his first two books, the crews of the sailing dinghies, Swallow and Amazon, and this island closely resembles Peel Island on Coniston Water. So popular have Ransome’s books been over almost nine decades that he is described by one literary scholar as having “changed British literature, affected a whole generation’s view of holidays” and “helped to create the national image of the Lake District.” Indeed, his influence has been such that several other authors have imitated his style. Their numbers include, at the age of nine, the author of this blog, neglecting the sage advice to write about subjects and places one knows well; at the time, he had never been in the Lake District where his manuscript was set! 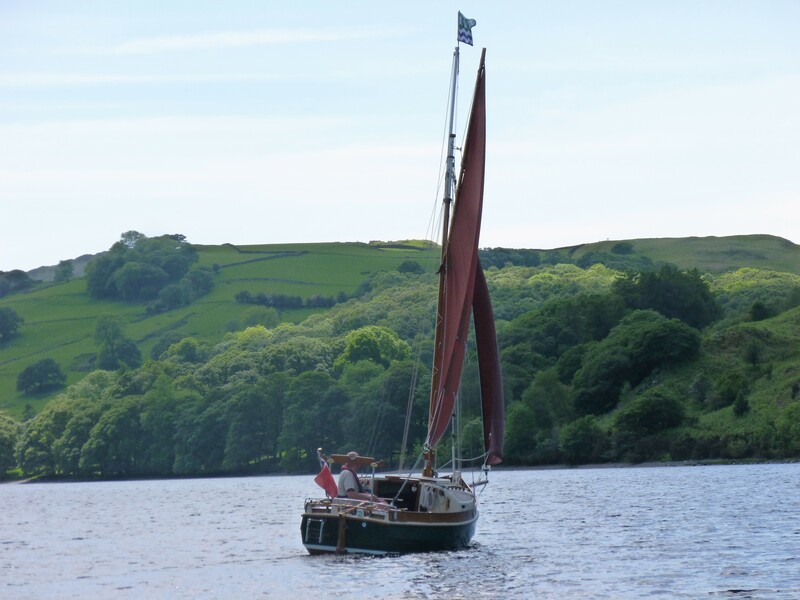 Ransome’s books have spawned a whole tourist industry around Windermere and especially the village of Coniston where you can catch a ferry for a tour of the lake and pass near to his Wild Cat Island, imagining that you are sailing the lake with the Swallows and Amazons. 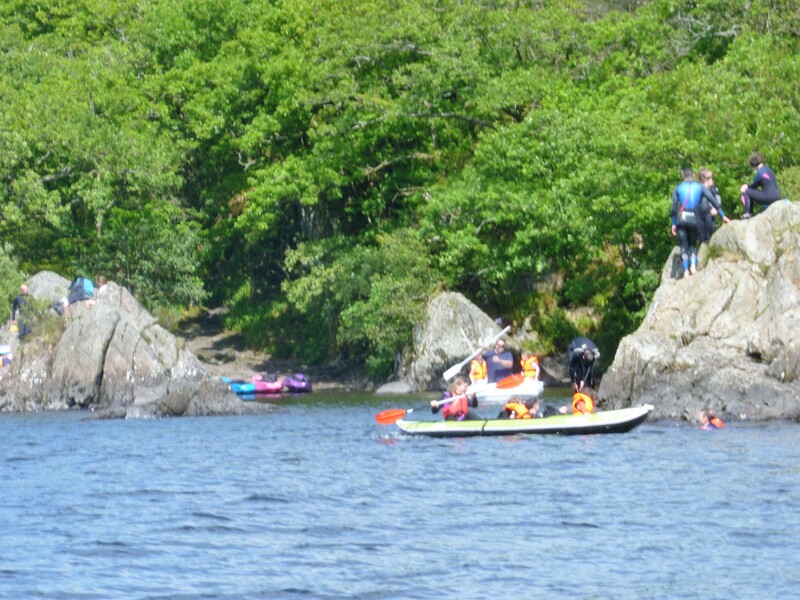 In fact, however, the lake and island are best seen for the first time from high above, coming by bus from Windermere. If one knows exactly when to look, there is a moment when you can see Wild Cat Island as a small, alluring destination at the far end of the lake, rather the way the crew of the Swallow gazed at it through a telescope from a peak at Holly Howe farm as they anxiously awaited a telegram from their sailor father granting them permission to camp out on the island during their summer holidays. Indeed, better than taking the bus all the way into Coniston is to alight high above the lake and walk to the village along footpaths, perhaps from Tarn Hows, one of the most photographed locations in the Lake District. 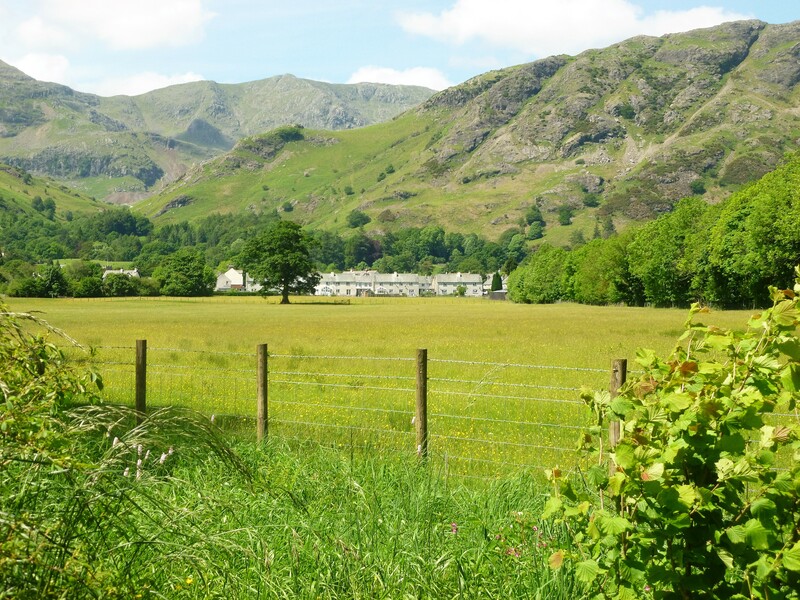 The views along the way are spectacular, especially as you approach the outskirts of Coniston and cast your eyes across the yellow fields to the fells beyond. Like the author of this blog, his children and grandchildren have all enjoyed Ransome’s books as bedtime reading. But on top of that, they have been fortunate enough to have had the added pleasure of acting out the island adventures of the Swallows and Amazons on their own Wild Cat Island on Georgian Bay in Ontario, Canada. In fact, unlike their fictional English counterparts they have had a wide choice of crown islands on which to camp and give free range to their vivid, childhood imaginations. 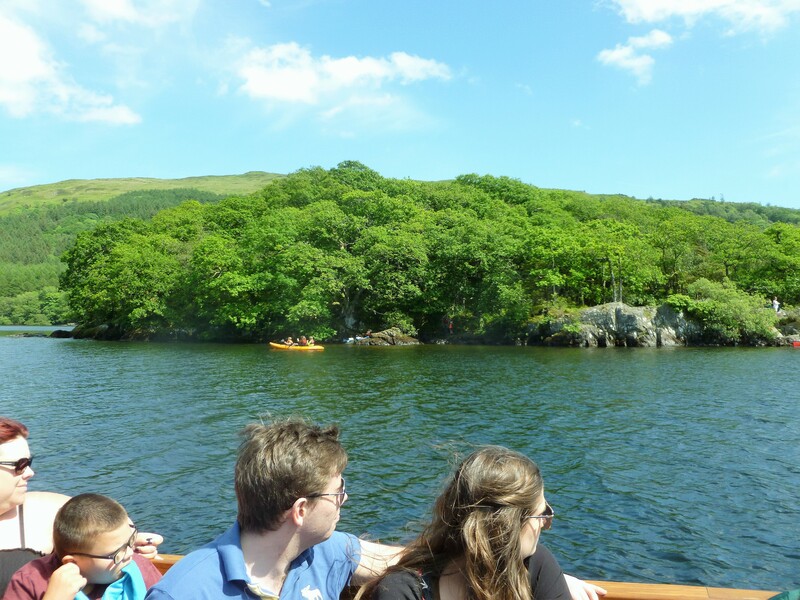 Given their own experiences, it is, however, perhaps best that they never visit Coniston Water and see the real Peel Island that Ransome used in his books, for the reality of the location today is far short of what they doubtless imagine from their childhood reading. 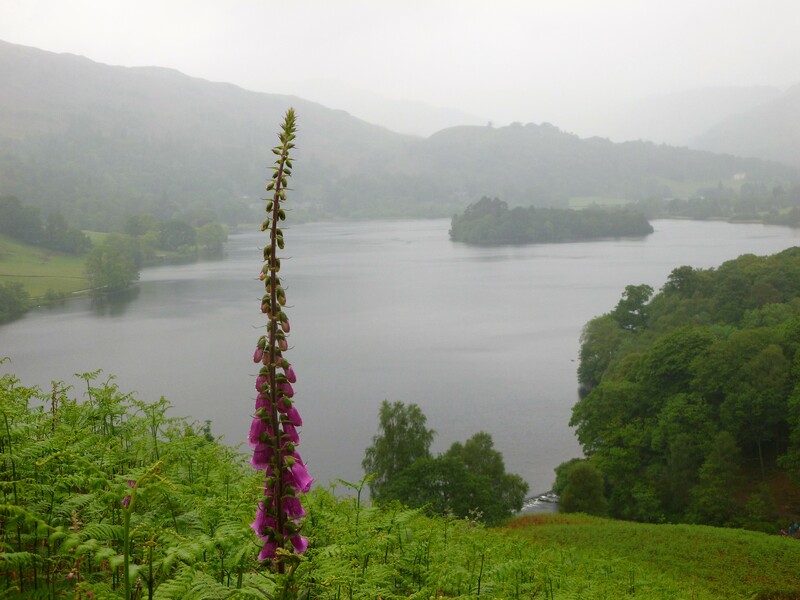 For, beautiful as it is, the Lake District is not the unspoiled region it was when Ransome composed his books. 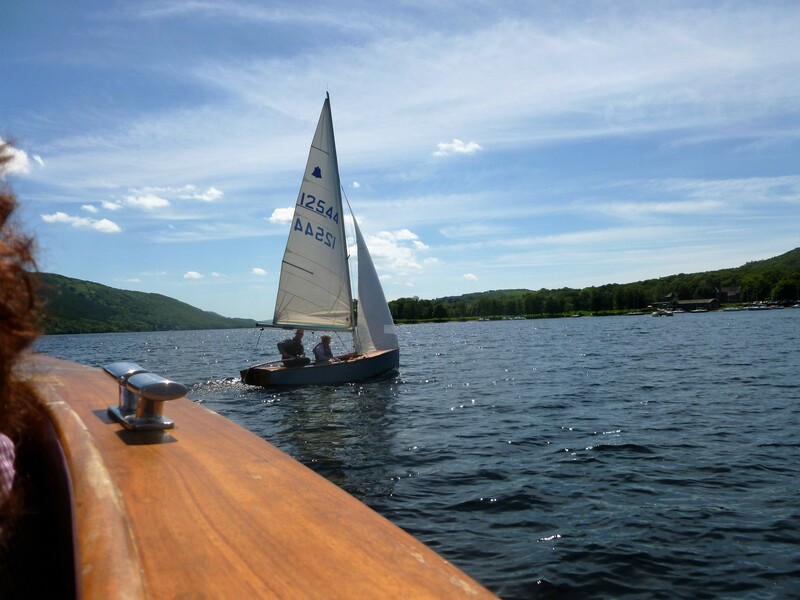 It is inundated with tourists and lakes like Coniston are crowded with sailboats, windsurfers, rowboats,kayaks canoes, launches, and ferries. 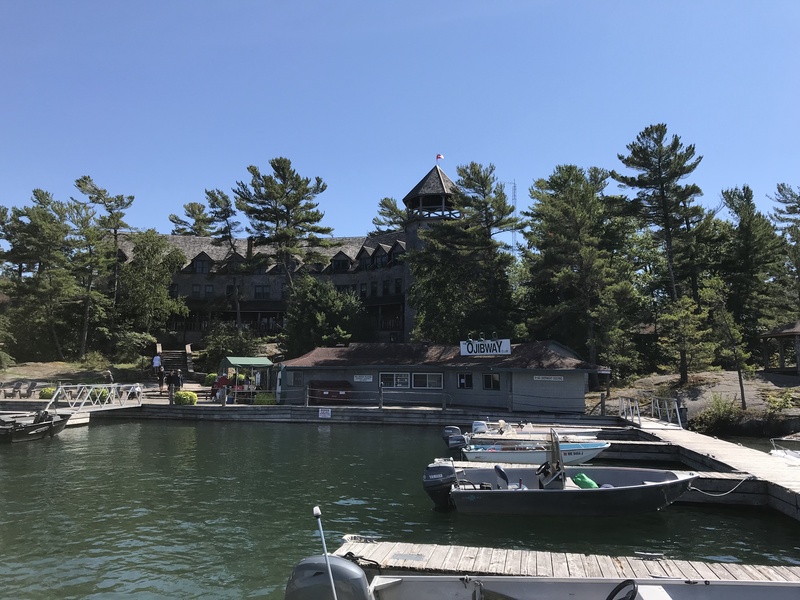 But this is nothing compared to the disappointment these Canadian readers and adventurers would feel on passing close to Wild Cat Island by ferry, for, like the lake itself, it is crawling with human activity: bathers, divers, walkers, rowers, and paddlers. And this is an image of the island in May, not July or August. It is true that the islands of Georgian Bay are also changing. No longer does the convention firmly hold that if another group is occupying a crown island, one should not land and expect to share it. But by and large, this old tradition still applies to smaller islands of the size of Wild Cat or Peel Island. And certainly, at any time of the year outside of mid-summer, the young have a wide selection of isolated locations where they can camp and act out their adventures in a wilderness environment, free of parental supervision and the prying eyes of passers-by. Contemplating the appearance of Wild Cat Island today recalls to mind walking from Aix-en-Provence in the direction of Mont Sainte-Victoire, along the route Paul Cezanne used to follow on his expeditions to the countryside to paint the mountain and its environs. It is for the French a reverential walk in the footsteps of a master–one that perhaps instills the belief that “nothing matches the beauty of the French countryside and the skill of its painters.” It is, in fact, a pleasant enough walk, but it is marred by heavy traffic along the route and, unless one is prepared to walk for hours, Mont Sainte-Victoire remains but “a distant blob of white, a small scoop of vanilla ice cream, licked flat at the top.” For a Canadian, it is no match for hiking to a ridge in Killarney Provincial Park, the way members of the Group of Seven did, and looking down on the little lakes below “like emeralds shimmering on the slender fingers of a princess.” (At The Table, pp. 112-113). No, the Lake District is undoubtedly a stunningly beautiful area, and it’s no surprise that it stimulated the imagination of Arthur Ransome and prompted him to make it the backdrop for the first of his famous children’s books. 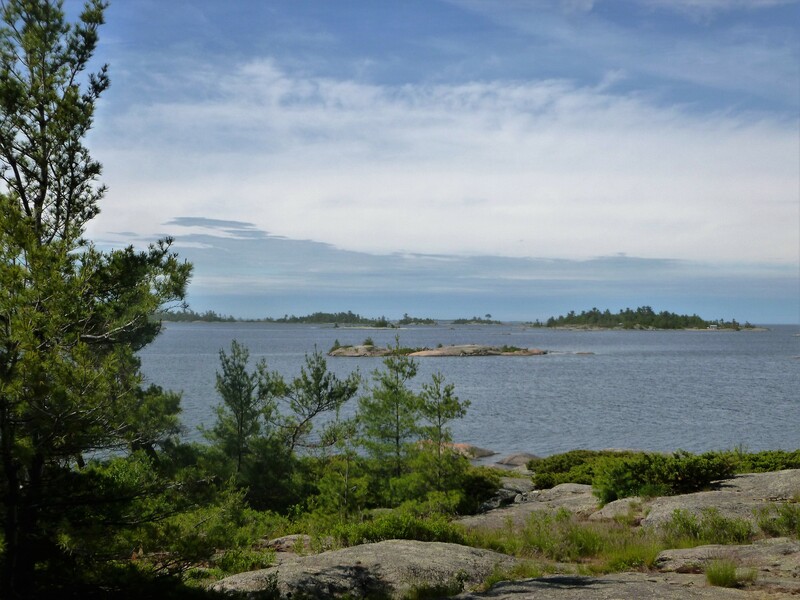 But for acting out the lives of his characters today, it is hard to beat the natural, quiet beauty of Georgian Bay, largely unsung though it may be outside of Canada.